Michael Mark is the author of two books of fiction, Toba and At the Hands of a Thief (Atheneum). His poetry has appeared and is scheduled to appear in The New York Times, UPAYA, Awakening Consciousness Magazine, Sleet, Forge, as well as other nice places. His greatest inspiration is his wife and then the rest of the world. I share your intrigue of the trees. 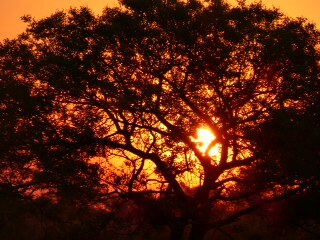 Lovely remembrance of Africa. Thanks Bonnie – I remember how your passion was such a warm part of our experience. I think that the way you see things that most take for granted is amazing. You have always been acutely aware of details that were beyond the obvious. I would read your work all day long if it was out there to be consumed. Peter – that is so kind of you, really. I will write more! Thanks! A bittersweet ending. But such are the feelings that make you take that seat next at the next opportunity. Patrick – exactly, I wanted to get out of that jeep just for a moment but reason held me back, already planning a new journey. Thanks for reading! I love this MFM trees are one of my favorite things! MFL – we agree on everything then! Impressed. A talent I don’t have and admire. Keep me on your list. Love reading your poetry, miss hearing you read it in Africa. I watch you taking pictures of the tree and could tell they meant something to you. I admire how you put those feelings into words.What a gift, thanks for sharing. Can I copy it to my African scrapbook? When I go back to Africa I look for you under the trees. Pat – Thanks for looking for me under a tree in Africa – please let me know if you find me. Of course – copy and paste in your scrapbook – I would happy to sit there with you! Thanks for reading the poem! I look forward to seeing more of your art! totally unbiased of you – thanks lolo – so happy for our journey together – but let’s keep that off line.